← Why Aren’t More Masses Offered Ad Orientem? The following is an excerpt from the homily by Rev. 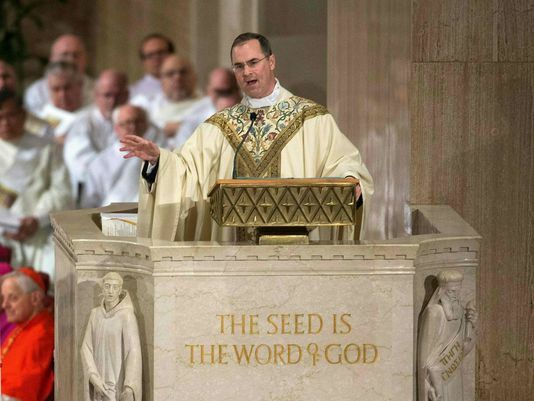 Paul Scalia, the son of Supreme Court Justice Antonin Scalia, at the funeral Mass for his father at the Basilica of the National Shrine of the Immaculate Conception. The full transcript can be found here. God blessed Dad with a deep Catholic faith: The conviction that Christ’s presence and power continue in the world today through His body, the Church. He loved the clarity and coherence of the church’s teachings. He treasured the church’s ceremonies, especially the beauty of her ancient worship. He trusted the power of her sacraments as the means of salvation as Christ working within him for his salvation. We look to Jesus today, in petition, to the present moment, here and now, as we mourn the one we love and admire, the one whose absence pains us. Today we pray for him. We pray for the repose of his soul. We thank God for his goodness to Dad as is right and just. But we also know that although dad believed, he did so imperfectly, like the rest of us. He tried to love God and neighbor, but like the rest of us did so imperfectly. He was a practicing Catholic, “practicing” in the sense that he hadn’t perfected it yet. Or rather, Christ was not yet perfected in him. And only those in whom Christ is brought to perfection can enter heaven. We are here, then, to lend our prayers to that perfecting, to that final work of God’s grace, in freeing Dad from every encumbrance of sin. Now he would not have exempted himself from that. We are here then, as he would want, to pray for God’s inexplicable mercy to a sinner. To this sinner, Antonin Scalia. Let us not show him a false love and allow our admiration to deprive him of our prayers. We continue to show affection for him and do good for him by praying for him: That all stain of sin be washed away, that all wounds be healed, that he be purified of all that is not Christ. That he rest in peace. My dear friends, this is also the structure of the Mass, the greatest prayer we can offer for Dad, because it’s not our prayer, but the Lord’s. The Mass looks to Jesus yesterday. It reaches into the past — reaches to the Last Supper, to the crucifixion, to the resurrection — and it makes those mysteries and their power present here on this altar. Rev. Paul Scalia is a Roman Catholic priest in the Diocese of Arlington, Virginia. Posted on February 21, 2016, in liturgy and tagged antonin scalia, fr. paul scalia, Scalia funeral Mass, Scalia homily. Bookmark the permalink. Leave a comment.